When making scones, moisture is key because nothing is worse than eating something that’s too dry. Luckily we have a great recipe to share today: Apricot, Cranberry, and Almond Whipped Cream Scones from Real Sweet by Shauna Sever. 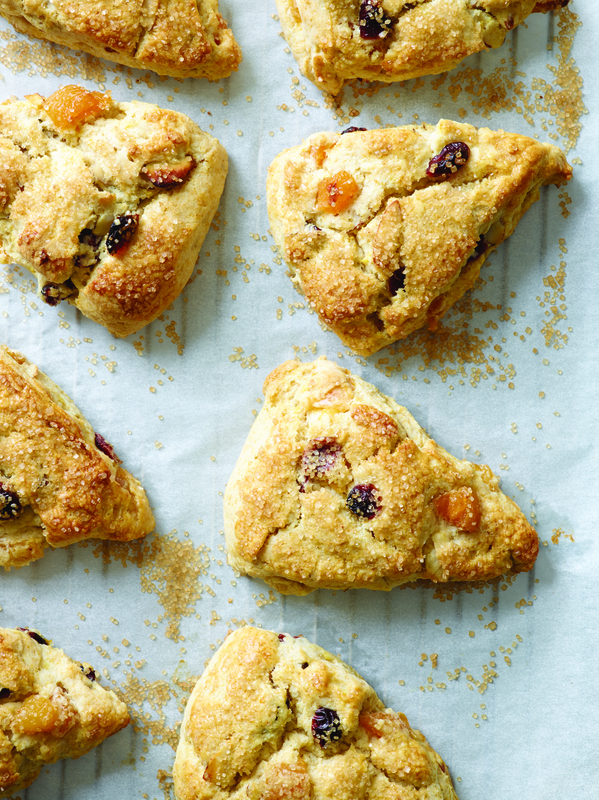 Not only are these scones light and moist, they have a sweetness and perfect amount of tang from the dried fruit. 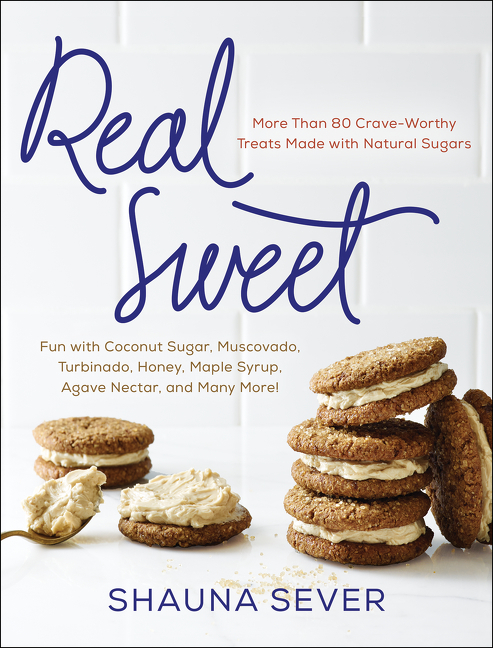 We’re excited about Real Sweet, on sale March 17, and will be sharing more recipes over the next few weeks. Real Sweet offers every dessert lover the delicious sweetness they crave in simple and delicious recipes using natural sugars that pack in subtly amazing flavors that elevate treats of every kind (and help us avoid overprocessed, one-dimensional white sugar). Written in Shauna’s fresh, modern, and charmingly funny style, Real Sweet lets every sweet tooth indulge without the guilt. Find out more about Real Sweet here, and pre-order your copy today! For the longest time, I was never really a scone person. To me, they were all too often leaden and dry, and neither sweet nor savory enough to be a baked good winner. But as it turned out, I’d just been having the wrong scones. Done right—made with a light touch, tasty add-ins, and just the right amount of honeyed sweetness and turbinado for sparkle and crunch—it’s a totally different, delicious story. Using a cloud of whipped cream, rather than just pouring in the liquid version, gives them additional lightness and a melting quality. 2 teaspoons finely grated orange zest **Whenever I use citrus zest in a recipe, I reach for unwaxed, organic fruit. TIP: This dough is a sticky one, but it leads to moist, fluffy baked scones. To keep the stick factor down–Not enough can be said about keeping the dough as cool as possible while it comes together and not overworking it—a bench scraper is really helpful for keeping the dough moving on the board without having to squish it with warm hands or add too much flour. 1. Position a rack in the center of the oven and preheat the oven to 425˚F. Line a baking sheet with parchment paper. Have ready an 8-inch round cake pan. 2. In a small, heatproof bowl, combine the apricots, cranberries, water, vanilla extract, and almond extract. Heat in the microwave on high power until steaming, about 45 seconds. Cover the bowl with plastic wrap or a clean tea towel and set aside. 3. In a large bowl, whisk together the pastry and all-purpose flours, baking powder, orange zest, and salt. Add the butter. Using your fingertips, rub the butter into the dry ingredients until the mixture resembles a coarse meal without any obvious little chunks of butter in the mix. toweling. Add the fruit bits and the almonds to the dry ingredients and toss with your hands to combine. 5. In a medium bowl, combine the heavy cream and honey. Using a handheld mixer, beat the cream to soft peaks. 6. Using a large, flexible spatula, gently fold the honeyed whipped cream into the flour mixture; it will look quite dry at first, but after several folds the dough will begin to come together. When no large puffs of cream remain visible, stop folding—don’t overmix. 7. Lightly flour a work surface, and turn out the dough onto it—the dough will be soft and sticky. Gently knead the dough 5 or 6 times just to smooth it out. Pat the dough into a disk about 6 inches across. Dust a little more flour onto the top of the disk and invert it, flour side down, into the cake pan. Press the dough evenly into the pan to shape it into a neat circle. Dust the top lightly with flour. Invert the molded dough back out onto the work surface. Using a bench scraper or large knife, cut the circle into 8 large wedges. Place the scones, evenly spaced, onto the prepared baking sheet. 9. Bake until the scones are golden all over, about 15 minutes. Transfer to a wire rack to cool. Serve slightly warm or at room temperature.